What can Yorkies Eat from Human Food? Please take care of your new puppies! 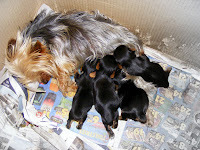 Tiniest yorkie puppies from Tim and Snoekie available by 04/05/12. Gorgeous long haired Yorkies and fine features.